Bangkok's Premier Business Directory & What's On Guide was a project so large I was nuts to start it. She's getting on a bit now but remains the only one of her type in Thailand. as seen on Google's chromeexperiments.com. I've written a small function which draws world maps on the fly within HTML's <canvas> tag. It is, if I say so myself, rather cool: go see! As seen on ajaxian.com and webmonkey.com. My 15 nanoseconds of fame, at last. 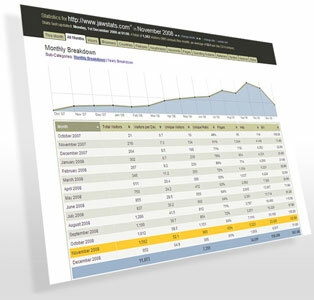 JAWStats is a free, open-source website statistics and analytics project I started in 2007. It runs in conjunction with AWStats and produces clear and informative charts, graphs and tables about your website visitors. I'm Jon Combe. I'm a 35 year old married English guy not really understanding life back in his home country after half a decade in SE Asia. I make lots of stuff for the web. I'm a User Interface Engineer Product Manager who likes maps, pie-charts and graphs. Nerd? Yup. See my portfolio and code.